With classes starting tomorrow, I have run out of time going over my month-long rotations. These sites were just as interesting and I enjoyed them as well. On this day, I followed my Resident to all of her meetings. 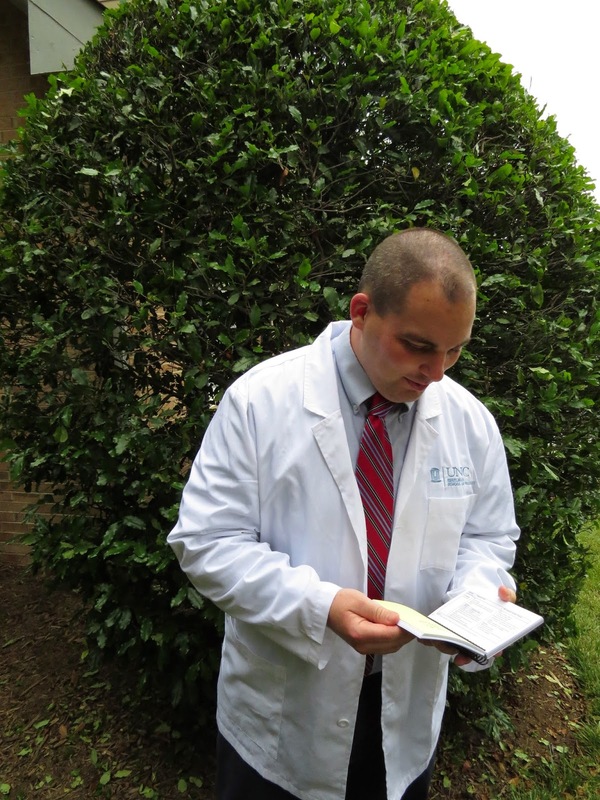 UNC offers a two-year Pharmacy Administration residency with a Master's degree and a teaching certificate. The wonderful ladies in charge of our month were both at the end of their second years. My Wednesday morning started with a huddle with the Investigational Drug Service followed by a meeting about where the money goes. IDS is not expected to make money, but somewhere the money that researchers pay for the service had been lumped in with other pharmacy accounts. After that, we went to the opposite side of the hospital to observe an interview and a meeting about transitioning into a management role. My favorite part about the last meeting was the source of her ideas - The Carolina Way by Dean Smith. I was excited about the inpatient day because at the end of the month I would start working there. This was a great introduction to where I would be spending every third weekend. I won't say much here because I have a much greater experience in the department now that I am employed. My rotation day started with a trip through the hospital filling Pyxis machines with patient-specific medications- take out expired meds and put in new. Fairly simple. When we returned I worked with the pharmacist checking medications that were being dispensed. Also in the CIP, the controlled substances people deal exclusively with the list of drugs that require special supervision - opiates, benzodiazepines and viagra. This day began with a trip around the hospital filling Pyxis machines with controlled substances = take out expired meds and put in new (sounds familiar). We restocked the locked cabinets after a trip to the supply room. The main difference here is that the numbers are taken very seriously. If there is ever a situation in which there are less of a drug than expected, they have to contact the hospital police who investigate the missing med. The Pyxis machines keep track of who signs in and the number of medication recorded in the machines. When the number is off they contact the person before and the person after the number changes. Usually it is just an accident, but it can have serious consequences - termination and criminal charges. They take this area seriously. My second residency day was a short time with the Infectious Diseases consult. In a hospital infections are incredibly serious. A lot of those infections begin in the hospital - surgery opens up your first line of defense. The consult group double checks the patients with an infection. They help with diagnosis and identify the correct antibiotic or antiviral to treat. There were some interesting cases- HIV-patients starting chemotherapy or someone coming back from overseas with a case of malaria. I am really interested in microbial stewardship. The pharmacist can play a huge role in the hospital managing antibiotics. Pediatric pharmacy scares a lot of potential pharmacists. People seem distressed by the additional math involved in calculated doses for a wide range of patients. They could be 3-kg newborn or an obese 16-year old. The dose must be accurate in every case which means calculation. Also, kids have a different metabolism and that can mean different standards from adults. Working in Peds generally requires two-years of residency. Kids also present another problem - they don't like taking pills. The Peds satellite fills a ton of oral syringes. In this case, you have to consider the taste. I tasted several of the medications for an iron supplement that felt like a bloody mouth to cherry- or bubble gum-flavored meds. I also went on rounds with the respiratory group in the Children's Hospital. They have a large population of kids with Cystic Fibrosis. Having taught about CF for many years, I was interested in meeting some of the kids and seeing how they are treated. My afternoon in the Cancer Hospital was similar to my day in the Sterile Products Area. Primarily, the technicians fill IV bags for the Infusion Clinics. In this case though, everything is hazardous. They work in a sterile room but they don't use open needles. They have a special needle system to prevent sticks. I was most interested in the names of the drugs - it was essentially a list of Biochem presentations. With that, I believe I have finished all of the rotations through the Hospital-IPPE. Tomorrow, PY2 begins with Drug Literature and Pharmacotherapy. Then I have to give up my short lab coat of rotations for the long, OSHA-approved lab coat of the PCL. The first year was great, and I only expect more for the second. 1. Midazolam - the sedative relaxes the patient and is given in the pre-care area. Working almost immediately, the patient is not unconscious but also will not remember anything about heading into the OR. 2. Fentanyl - the narcotic pain killer helps to make sure the patient does not feel anything. This is given after the patient has been transferred to the surgical table. 3. Lidocaine - the local anesthetic prevents the burning sensation upon the administration of the next medication. 5. Succinylcholine - the paralytic makes sure the patient cannot move while the surgeon operates. During the actual surgery, the surgeon goes to work opening up the patient. While the kidneys are in the back of your body, the new kidney will be placed in the front. The surgeon must first get through a lot of tissue which involved cauterizing the incisions. I won't soon forget the smell of burning flesh. 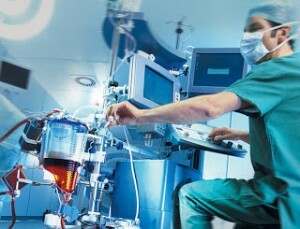 Once he reaches the kidney, he must disconnect all the pipes to and from the kidney to be refitted for the sister's kidney. Meanwhile, the CRNA continues to monitor the patient's vital signs - adjusting knobs on the ventilator and providing a small electric shock to check for paralysis. Soon the sister's kidney is brought in from next door in a large silver bowl. When the surgeon finishes detaching the original kidney, he moves to a separate table to inspect, clean and prepare the new organ. But when he goes to the other table, the patient is still there. Opened up with clamps and things sticking out of her! Sadly, this was the point that I had to leave to go to a meeting. The surgery would last for another few hours, but I would not be back in time. Overall the process of renal transplant was amazing. The amount of drugs pumped into a patient for induction, maintaining, and waking is incredible. I witnessed about 7 or 8 medication, with several on the table in case of emergencies. If anything else was needed, a Pyxis machine was available with a healthy stock of medications. That kind of concerned me. The nurse could grab just about anything, the doctor could order anything at any time. But there was not form of pharmacist verification with any of it. The OR seemed like the Wild West, where the laws of pharmacy were no longer valid. There was a phone to call a pharmacist if there was a question, but it was completely up to the nurse and the surgeon. I am by no means questioning their abilities, but it seemed odd after learning about order verification and other steps to avoid medication errors. After returning from my meeting, I spent time with the OR pharmacist. They actually rotate from the Inpatient Pharmacy up to the OR on some kind of schedule. Which makes sense, you definitely need someone who knows with IVs in an OR. Strangely, no pharmacists are in the satellite for the evening or night shift. There are technicians, but if something needs to be verified, they must call or travel down to the CIP. When I sat with him, the pharmacist was busy verifying the antibiotics for the next day's operations. When patients prepare for surgery, they are given a prophylactic administration of antibiotics. The most important surgical complication comes from post-operative infection. Different surgical areas must prepare for different types of microbes. Upper body surgeons are concerned about Gram-positive bacteria like Staph and Strep. They tend to order ceFAZolin. Lower body and GI surgeons encounter more Gram-negative bacteria. Interestingly, urologist typically order levofloxacin. Anyways, he went through the each patient to make sure that the antibiotic matches up with the type of surgery. Instead of memorizing the antibiotics, UNC has prepared a list of common orders for every category and other criteria. For some medicines, the pharmacist must check renal function by calculating CrCl using a common equation (CrCl=(140-age)/SCr). Levofloxacin and Meropenem were most commonly ordered and checked for renal function. Gentamycin was much more difficult to dose as it is based on the patient's ideal weight determined through a complicated equation. The surgeons commonly only use the patient's actual weight, but the pharmacist must change the dose. If gentamycin is dosed incorrectly for extended periods, it can result in ototoxicity (hearing loss). As you can tell from the length of this post, I really enjoyed this day. I learned a lot from observing the CRNA and sitting with the pharmacist. Who wouldn't enjoy a kidney transplant? To me, the OR seemed like an open opportunity. More than just short staffing problems, but about the verification process of surgical medication. The pharmacist could have more of a role during surgery. They may not need to be in the actual room, but there could be a place for more aggressive involvement. Hospitals perform hundreds of surgeries a day. I feel like the OR could be a possible frontier in the future of pharmacy. Parkinson's, etc. I was not disappointed with my day in pediatric behavioral health. We started the morning by talking about a few basic things like introductions, the layout of the ward, how the rounds would work and then went up to the pediatric psychiatric unit. The doctors, residents, nurses, and their teachers piled into a very small room to discuss the 10 children on the ward for the day. These were some serious 9-13 year olds who had been through more than most people in their 30s. These kids were diagnosed with MDD, ADHD, ODD, Mood D/O with symptoms of SIB, SI, HI taking various amounts of Prozac, Lexapro, Concerta. Some stay in the unit for a few days, but others had been there for a month. The Hospital School addresses their education needs while they are in the hospital and the teachers work closely with the doctors. The Hospital teachers would contact the home school for information and IEPs - pretty much every kid had one. Parents would come during visiting hours with a pass, but generally the kids cannot leave the floor. We talked about their medication treatments, but mostly these kids required intense therapy and behavioral plans. To treat the younger kids the doctors prefer hugs to drugs. As a pharmacist, we sometimes forget that and go straight to medications. But let's not forget that these kids are on some serious prescriptions. Fluoxetine and escitalopram (SSRIs) were the favorites for depression. Agitated patients would also recieve ropinarole, a 2nd gen antipsychotic). But then the agitation could be due to the ADHD requiring a stimulant. Even if the patient was on only 2-3 drugs, there was a lot to consider in matching the medication to indication and achieving therapeutic doses. For another point, you don't want to open the door to greater abuse in young children by prescribing long-term benzodiazapem. Pediatric dosing for neuro-drugs was different as well. Usually, the doctor titrated up from the lowest dose available until reaching an effective point. Not only are these kids growing, their brains continue to develop as well. Unfortunately, I had to leave for a meeting before actually meeting with the kids and families. They had left for the Hospital School when we came out of our meeting. The resident showed me the other areas on the floor for adolescents and eating disorders. I learned a lot during this day and was actually able to talk about this more due to my education background. As a subspecialty, Pediatric Behavioral Health would be incredibly interesting, but potentially devastating. I was glad to experience it. At any rate, almost every pharmacist will dispense psychiatric drugs to pediatric patients. One in 13 children take some kind of psych med in the US. It is important to see the most extreme cases to understand the others. Of all our locations during the IPPE month, the Sterile Products Area (SPA) worried me the most. We would be required to fill IV bags with medicines that would go to an actual patient in the hospital. Sure we learned and demonstrated aseptic technique during the lab class, but this was real. Messing up in here could lead to an infection in the patient or overdose or underdose. There are a lot of ways to be wrong when filling IV bags or syringes. Going into the room was just as predicted. No ties or jewelry. Put on the bonnet, face mask and shoe covers. After a thorough hand/forearm washing, you don the gown and step into the sterile area. Apply some alcohol to your hands in case you missed anything and put on the special, tight, sterile gloves. Oh and some more alcohol. Essentially, in the SPA the answer is always alcohol. Now you are ready to get to work. After collecting a long list of medication orders, you fill a table with the appropriate drug and bag. Then you start filling. Now at the table, more aseptic procedures prevent contamination. In lab, we worked with a horizontal air flow. Nothing should get in between the filter and their products. In this hospital, we had a vertical air flow, so nothing should be above the needle or bags. This includes your hands. Clean your area with some alcohol, spray your gloved hands, and the ports on the vials and bags. Now you are ready to stick a needle into the vial. After withdrawing the correct amount, inject that into the IV bag of normal saline or dextrose. At all times, remember the air flow comes from above. If you accidentally pass over the bag, spray the port with some alcohol. Finally, cap your needle and put into the sharps container. Place the label on the bag and hand it off to the pharmacist. I was really nervous for the first couple of bags, but I had no problems and started to move along. We did some reconstitutions by adding sterile water for injection into a vial of dry powder before putting it into the bag. We used a transfer needle which squeezes the bag's fluid into the vial, mixes the solution and passes the medicine into the bag. Everything was moving along until my partner had a major accident. While I was dutifully removing air bubbles from the syringe, a rather large needle went flying past my face along with a few choice words. She had accidentally stuck herself in the thumb. Before I could turn around, she was gone. There wasn't much I could do other than clean up the area and finish my batch. I felt really bad for her. All of that was before lunch. After our lunch meeting, I came back to the SPA to work with the pharmacist. We checked the bags that the technicians (including me) filled. You check the contents of the bag, the drug from the vial and the volume from the syringe. Everything must match up to the order before putting your legal initials on the label. We went to the nutrition area to check the TPN (total parenteral nutrition) for the patients that can't eat. A lot of products do into a yellow fluid to provide calories, carbs, proteins and fats to an unconscious patient - also a lot for babies in the NICU. Some IPPE students that the other hospitals throughout the state spent an entire week in the IV room. We worked in the SPA for one morning, about 3 hours. I would have liked more time to fill IV bags and use the aseptic technique we worked on. But I don't know what I would have wanted to give up more time there. The SPA technique is complicated, but a simple checklist helps prevent you from missing anything that might hurt a patient. I believe I would be comfortable as a pharmacist in the IV area. You have to know a lot about compatibility between the drug and the fluid. A lot can go wrong in the area, but you definitely use a lot of the knowledge you accumulate in pharmacy school. I spent a day in Special Formulations area tucked into a small corner in the back of the Central Inpatient Pharmacy. This was one of the days I looked forward to the most for the IPPE. 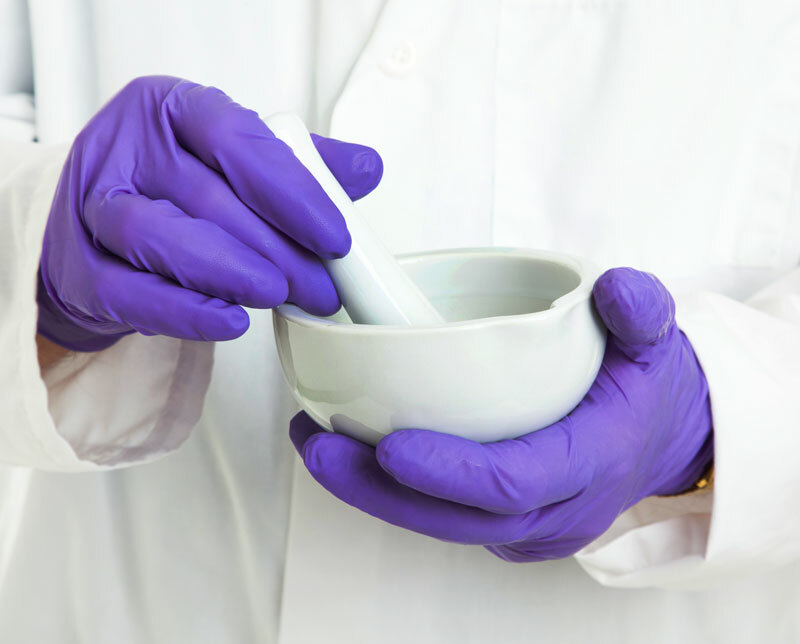 I ACTUALLY enjoy compounding because it is more like old school pharmacy (as the chemist or apothecary). Most medications come straight from the manufacturer as a pill, but some have to be prepared into an IV bag or oral syringe. Compounding changes a manufactured product into something else. This is where the mortar and pestle of the pharmacy come from, and they had a huge mortar. Mafenide - Yellowish powder that must be added to 1L of Sterile Water for Irrigation. Indicated to prevent infections in burn patients. For some reason, many of my classmates dislike compounding. It is just like cooking. You follow a recipe, except that you have to accurately record the ingredients that you use (Amount, Name, Manufacturer, Lot Number, and Expiration Date). 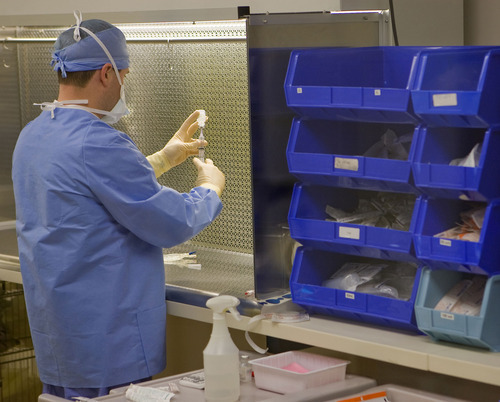 Some pharmacies focus entirely on compounding and ship out to local hospitals. But also, some compounding pharmacies have found trouble with their products and over stepping their bounds (that is a post for another day). If you like baking or you enjoyed chemistry labs, you would have enjoyed a day with Special Formulations.